The inspirational text of a Langston Hughes poem is set perfectly with an easy vocal ostinato to support the lyric. Available separately: SATB, 2-Part. Duration: 3:00. The attention to detail by the poet as she describes the features and attributes of her subject--soft rounded cheeks and eyes as bright as sunlight on a stream is captured in this subtle and yet passionate musical setting of the beautiful Rossetti poem. Written for the 50th anniversary of the Chicago Children's Choir, this jazz-infused gospel original was inspired by the great spirituals of the past. Marked by invigorating rhythms, bluesy melodies and full harmonies, this work makes a wonderful concert closer or mass-choir finale. Duration: 3:30. This rousing spiritual set for mixed or treble voices and piano will be a great concert closer. 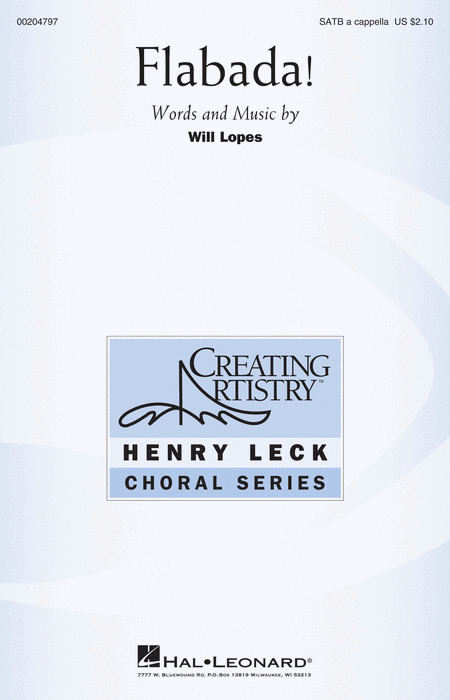 Commissioned by the North Carolina MEA for the 2005 Middle School Honor Choir, this bold setting by Henry Leck and Martin Ellis will become a standard in concert choral repertoire. Performance Time: Approx. 4:30.Available separately: SATB and 3-Part Treble. Andrea Ramsey : Hark, What Music Fills the Sky! This serene setting of the traditional French carol for voices, keyboard and flute will be an excellent processional or combined number for Christmas concerts. Each verse has a special flavor leading to the final stanza with its glorious descant and concluding Hallelujah, amen. This fervent and emotional gospel chorus repeats and builds to a magnificent conclusion. Excellent for middle school, high school and beyond.Available separately: SATB. Performance Time: Approx. 3:00. Featuring Langston Hughes poetry, this work begins with a joyous gospel opening with three layered vocal parts, and then unfolds into a powerful affirmation of the human spirit. Available separately: SATB, 3-Part Treble, VoiceTrax for 3-Part Treble, Instrumental parts available digitally (asx, tpt 1, tpt 2, b, dm, vn 1, vn 2, va, vc). Duration: ca. 3:20. This expressive gospel style original offers a powerful message of hope and encouragement. The shape of the song and drama of the text is created by the gradual building of intensity, dynamics, tessitura, and texture. An excellent graduation selection or concert closer! With music perhaps dating back to the 8th century, this is one of our most treasured advent carols. This edition for choir, brass and organ makes a wonderful processional as each verse unfolds into a more glorious resounding. A fantastic selection for combined mixed and treble ensembles. Duration: ca. 3:50. Available separately: SATB, 2-Part, Brass parts (tpt 1 & 2, hn, tbn, tba). From its gentle opening of graceful simplicity, this expressive setting of a 19th century text gradually builds into an outpouring of hopefulness and comfort. Stunning! Composed in an African-American gospel style this work of joy and commitment may be performed in both sacred and secular settings. My heart is overflowing, my heart is growing in gratitude - this will create a powerful connection between singers and audience! Incorporating the Pie Jesu and Agnus Dei texts, this setting is a heartfelt expression of gentle devotion and lyric beauty. From simple unison lines, to striking melodic contours and full choral textures above rich instrumental sonorities this is a work of depth and emotion. Now available in an SATB edition, this gorgeous, majestic setting of Psalm 8 was originally commissioned by ACDA for the 2011 National Children's Honor Choir conducted by Henry Leck in the SSA voicing. Emerging from silence, the ethereal opening moves into more flowing phrases, with violin obbligato and the djembe adding a subtle world music flavor. Inspirational! Includes parts for violin and djembe. Available separately: SATB, SSA. Duration: ca. 5:00. This fervent prayer for peace is richly arranged now for SATB voices, violin, and piano. A touching and reverent work for sacred services and concerts. This beautiful lullaby with poetry by Christina Rossetti features warm vocal lines over a gently undulating accompaniment. Expressive melodic phrases and unexpected harmonic turns create an atmosphere of charming musical sophistication. With piano music mimicking a flowing stream and a lyrical, yet bounding vocal melody, this work - dedicated to Indianapolis Children's Choir director Henry Leck - evokes his upbeat, energetic and inspiring musical leadership, creating a work that all choirs can enjoy. With bodhran. A persistent underlying rhythm gives this setting of the Langston Hughes poem a powerful and mysterious drive. Available separately: SATB, 2-Part. Instrumental parts available digitally (bass, congas). Duration: ca. 2:50. 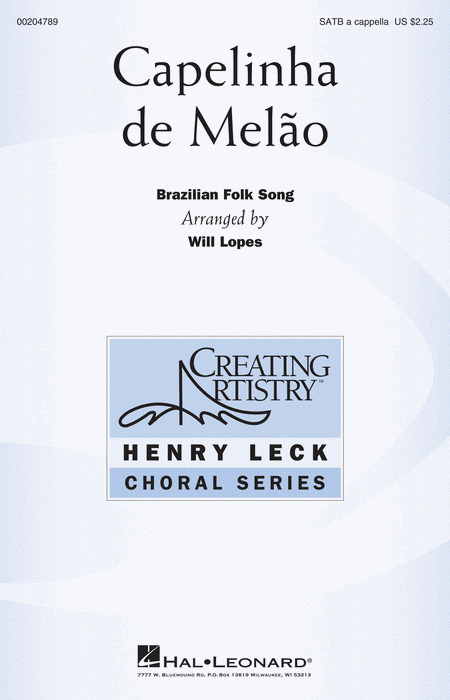 The gentle rhythms of the rainforest combine in this shimmering original choral work for any combination of voices. Optional percussion. Available: Any Combination. Performance Time: Approx. 4:30. After a moving original opening this patriotic selection moves into the always inspiring America the Beautiful that will be perfect for audience participation. Ideal for school, church and community concerts!